For Immediate Release: Posted On 8/23/2010 By Industrial Magnetics, Inc. Eliminate the need for welded tabs when performing material leveling and alignment, or high/low mismatch operations, with the new, magnetic Mag-Pry™ by FitUpGear™ from Industrial Magnetics, Inc.
Up to 100x faster than traditional plate matching welding methods, the Mag-Pry™, featuring MagSwitch™ technology, saves time and increases production rates by utilizing a powerful, on/off rare earth magnet attached to a leveling bar to align and hold two separate pieces of steel together for a seamless weld. The strong, non-marring, Mag-Pry™ has 1,100 lbs. of breakaway force with a locking T-handle for safety and offers easy, on/off actuation of the magnet with a simple twist of a switch - no electricity is required. To operate, simply place the magnet on the “low” side of the steel, turn the locking T-handle to the “On” position and press down on the leveling bar (high side) while you weld the two surfaces together. 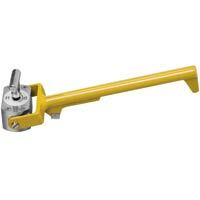 When securely held, turn the T-handle to the “Off” position and finish your welding operation. The Mag-Pry™ works on all plate and seam work, under foot, on vertical surfaces and even in overhead welding applications. For more information and to watch the product video, visit the MagPry™ Product Page.